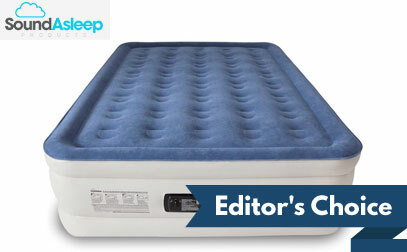 Are you searching to find the best rated air mattress available this year? If so, you've come to the right place. Our detailed buyer's guide will help you find the perfect air bed for your needs! You could be looking for an affordable option for your home or apartment. After all, ‘regular’ mattresses are quite expensive, where you can easily have one of these for a couple hundred bucks or less. Or, you may be looking for one because you are going out into the great outdoors, having guests over to the house, or you want to have something to pack away in your car for a long road trip. Whatever the case, you want to be sure that you wind up purchasing the right blow up bed for your needs. With that in mind, this buying guide has come to the rescue. We have put together the following information to help you make a smart decision on your inflatable mattress purchase. You will find information about ratings, along with some specific product recommendations. In the end, we hope that this page includes all of the information you will need to buy the right model for a fair price. When you want to make sure your guests are as comfortable as possible while sleeping over, SoundAsleep makes for a great choice. There are 40 internal air coils to improve support and durability. Also, you or your guests can quickly inflate the mattress with just the push of a button. An internal pump will do all the work, and the product will come to size in around four minutes. It's a queen air mattress and is considered a double height model. The reviews are some of the best that you will find in this market. Buyers have plenty to say positively about this product, praising everything from the comfortable sleep it offers to the attractive looks. You aren’t going to find many negative comments at all about this item, making it one of the top contenders in the market. If you have guests coming and need temporary bedding for them to be comfortable, they will appreciate your investment in the SoundAsleep Dream Series. The comfort and support that is offered by memory foam is just a bonus. 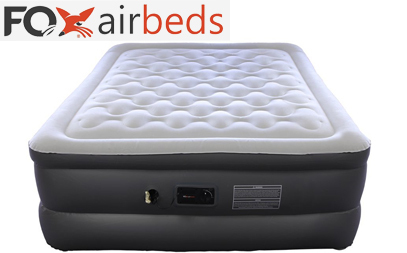 Fox Airbeds sells one of the leading products on the market with this product, which has a memory foam top above the air chamber. There are also two pillows included, along with a built-in two-way pump for inflation. While there is the pump built into the product, you also have the option of inflating with an external pump if you so choose. If you decide to purchase this product, you will have your choice of five sizes from Twin XL to California King. While a lot is going for this mattress, there are also some considerations to recognize as well. On the positive side, some of the compliments for this product include its comfort, the ease of inflation, and the fact that you don’t bounce around when the other person moves. Looking at the reviews, there is some concern about its ability to stay fully inflated through the night. Also, the top may be slightly challenging to deflate once it is overinflated. In all, this is one of the best products according to consumer reports and is worth consideration because of its inclusion of memory foam, but take note of the potential considerations before you buy. If you are in a position where you are going to be using it for an extended period, you want to make sure it's the most comfortable air mattress you can buy. While the Insta-Bed Raised might not entirely be the same as a traditional mattress, it does have plenty of great features. It is 18″ tall, meaning you will have an easier time getting in and out of bed. Also, it has a neverFlat pump, which silently re-inflates the bed as you sleep, so you don’t wind up on the floor by the end of the night. Also, the main pump will do the job of inflating the air bed in only four minutes so that you can be set for bed quickly and easily. Not surprisingly, it is the second pump that earns much of the praise in the reviews for this product. Buyers are impressed with the way the backup pump works to keep it inflated at night, and they also appreciate how easy it is to set up and use. For long-term accommodations, or even for guests, there is a lot to like about this option. The needs for an air bed backpacking are significantly different than when setting it up in your home. When you're out in nature with a tent, your priorities are going to be a compact size, overall light weight, and ease of use. You will probably be willing to sacrifice a bit of comfort for these characteristics since you will only be spending a few nights on it. 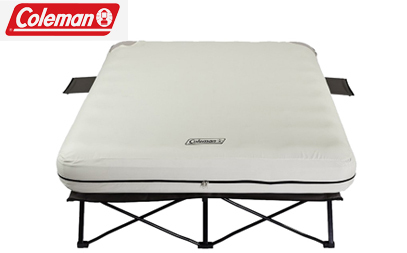 This option comes from the respected brand Coleman, and it includes a cot for sleeping up off of the cold, hard ground. The frame can support up to 600 pounds, and there are even two side tables. There are plenty of great reviews for this Coleman product, which isn’t a surprise given the reputation that Coleman has in the outdoor market. Most feel that this is a comfortable option for sleeping while camping, and the included pump is appreciated as opposed to manually filling with air as usual while in the wilderness. However when it comes to the weight of the frame, as some buyers feel it is a little too heavy. If that is not an issue for you, though, you should be pleased with this product overall. Check out our Best Air Mattress For Camping guide if you're looking for more great outdoors options. Planning on spending a night or two sleeping in your vehicle? If so, you may want to pick up one that will allow you to get good sleep even in those cramped quarters. This product is designed to work in many different vehicles, including sedans, SUVs, and more. The unique aspect is a chamber of air meant to fill in the gap between the floor of the car and the surface of the mattress. This will allow you to sleep efficiently on a bigger surface than if you were trying to just sleep across the seats. There are mixed reviews for this item from those who have purchased it previously. On the plus side, some buyers have been impressed with the way this mattress offers a comfortable place to sleep in the car. However, quality issues have been a problem for some buyers, which is not a huge surprise at this modest price point. If you need a short-term option for sleeping in the car, this item can be seen as a potential solution – but it probably should not be counted on for long-term performance. 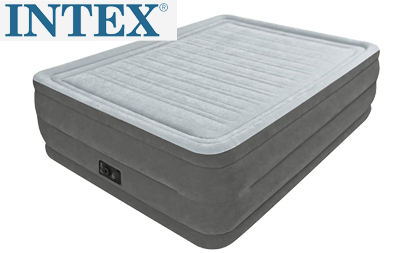 Intex is a brand with many entries in the market, and this one is a Queen-sized bed with a height of over 16’’. 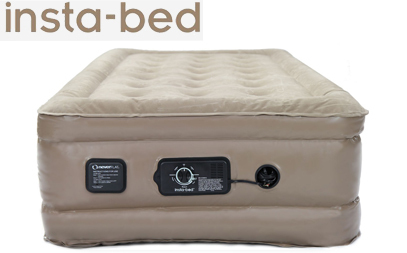 There is a built-in pump to make it easy to inflate the bed, which only takes around four minutes. The flocked top is waterproof, the top chamber helps to add a fitted sheet with ease, and there is even a carry bag for simple storage. The capacity of this bed is 600 pounds, so it should handle two adults with very little trouble. When used as intended, this is a product that has earned the praise of many buyers. Users appreciate that it is easy and quick to inflate, is comfortable and will work for out-of-town guests. However, the issue with this product for some seems to be durability, as there are reports of them breaking down after a period of use. That is the case with many blow up mattresses, however, as they aren’t designed for consistent performance night after night. As long as you are only looking for a mattress that will be used occasionally, this product should get the job well done. This unique product sits on top of a frame, elevating it slightly off of the floor. The mattress itself is 11.5″ thick, it is a Queen size, and it can be inflated in just four minutes through the use of the included pump. 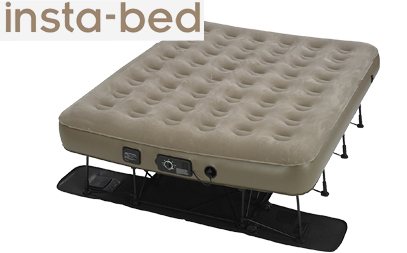 As with other Insta-Bed products, this model also includes the creative neverFLAT pump which keeps inflating throughout the night. Buyers generally feel that this bed is a nice option for guests who will be staying in your home without a permanent bed available for the night. The comfort of this mattress is good, as is the bag that is used to contain the unit when it is not in use. The noise produced by the backup pump can be seen as a downside, but that shouldn't take away from the overall performance. No buyer will mistake this product for a low-cost option, but it does have a unique design and can serve a great purpose in your home. For users who have a difficult time getting down to floor level, this option from Intex is a great one to keep in mind. 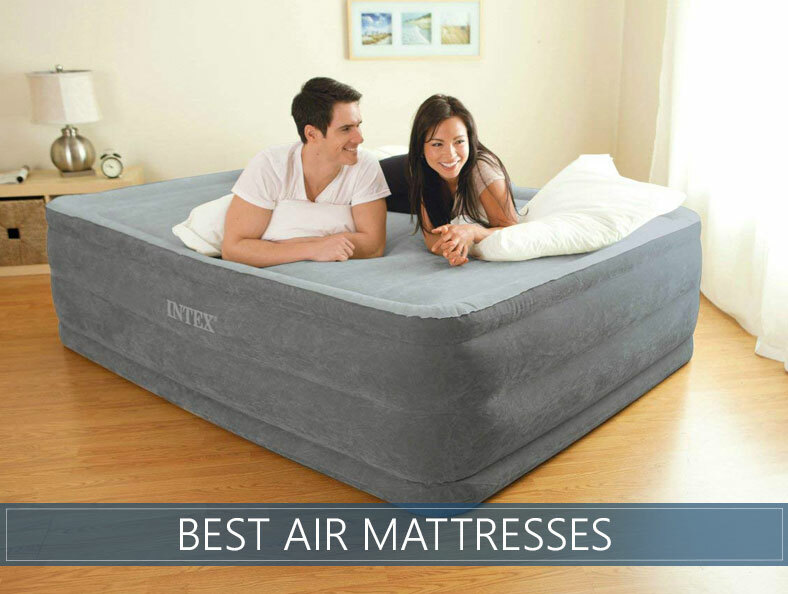 At 22″ thick, this is one of the tallest air mattresses you are going to find on the market. Even at that height, it comes at a reasonable price point, has a duffle bag for storage, and includes a waterproof top. The built-in pump will fill up this mattress in less than five minutes, and that same pump can deflate the mattress as well. Past buyers of this product have a lot of positive things to say about its value and performance. Users have praised the comfort and ease of setup, as well as the price and the quality. Some users have complained about leaks, but of course, that is something that can happen to any air mattress at some point. Beyond those occasional issues, this appears to be a product you can turn to for reliable performance. 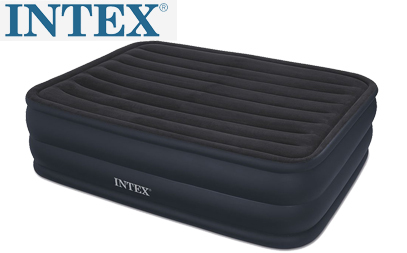 Intex is one of the most reputable air mattresses on the market. To learn more, read our full Intex air bed guide. Another extremely tall option, this one is 22″ thick and comes with a built-in pump. Less than five minutes will be required to inflate fully, and the sides of this product have been explicitly designed to keep your sheets in place as you sleep. There is a carry bag included, which has one of the lowest price tags on the market for this type of product. When this product is filled and working correctly, it has been reported to feel fantastic. Unfortunately, there have been some quality issues reported by a few past buyers, so keep that in mind as you consider your options. While all of these products have the potential to leak, that problem seems to be more common with this model. With that said, considering the low price point, it is still an option to keep in mind. If you are willing to spend north of $100, you can pick up this model from WonderSleep. A number of great features will be included for your money, such as a fast inflation/deflation pump, an array of air coils to help with the firmness of the mattress, and a flocked top for added comfort. There is a one-year warranty on this item, which includes a carry bag for storage. Given the lofty price point, you would expect buyers to be impressed with the performance and quality of the product – and by and large, they are. Compliments include the ability to control the firmness of the mattress, the built-in pump, and the ability of the mattress to stay inflated through the night. Some users complain that it failed to hold air after a period of use, but again, that is a problem that can pop up with just about any brand or model. 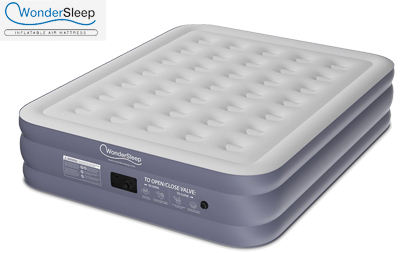 The WonderSleep may be on the high end of the price scale, but it is still one to watch. One of the first things to consider related to this purchase is what type you are going to buy. Blow up mattresses have come a long way since they were all just a thin layer of air which kept your body (barely) off of the ground. Today, there are numerous models on the market, each with their own advantages and disadvantages. Deciding which type to purchase comes down to the intended use of the product, and the budget you have available for the purchase. Many people are going to be looking for a raised mattress, as these are easier to get in and out of than one which sits low to the ground. Raised ones look quite similar to traditional mattresses once they are inflated, and they tend to be rather comfortable as well. Another option is a convertible air bed, which is one that can serve as a piece of furniture as well. This is great if you want somewhere comfortable to sit when you aren’t laying down to sleep. Self-inflatable ones have the pump built right into the product, which is a distinct advantage from a convenience standpoint. Finally, we have one with the frame and rails included that will act more like a permanent solution to your sleeping needs. Generally speaking, the comfort level offered by a good air mattress is going to be directly related to the thickness. A thicker one will usually be more comfortable than a thinner option, as you are going to have more air underneath you throughout the night. It is common to lose some of their inflation overnight – especially if the night is cool – so starting out with a thick pad of air beneath your body is the best bet. With a thin mattress, it is possible to start the night somewhat comfortable, only to wake up with your body at least partially on the ground as it has deflated. Learn more about why blow up beds deflate. Another comfort point to be considered is the possibility of having a different material – such as memory foam. In this case, you are using the air in the mattress to support your body weight, but you get the added comfort of material like foam. 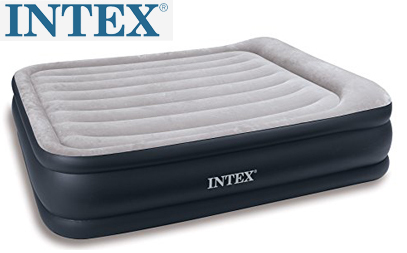 These tend to be more expensive, but they do provide a comfortable night’s sleep in most cases. 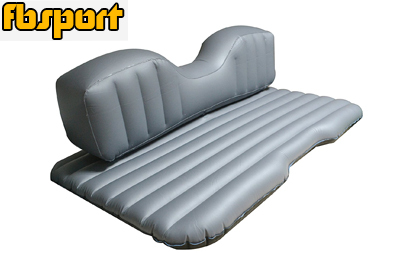 Just like regular ones, inflatable beds are available in different sizes, generally ranging from Twin to King. Choosing the right size is an important consideration and one that largely depends on your needs. Twin and Full sized beds tend to be an excellent choice for outdoor users. Unless you have a family, there's no reason you're going to want a big bed when it's going under in a tent. The most common is the Queen size. It's big enough to sleep two full adults but smaller than a King; it won't take up your entire living room, or spare bedroom. Manufacturers make Queen sized more than any other, which gives the consumer many options to choose from. Don't worry as our top picks are listed in this buyer's guide. Lastly, there is the King size. If you've got the extra room and don't mind paying more than what the Queen size will cost, the King is a great option. If you're using it for guests, they will definitely be happy for the extra sleep space you gave them! You love your animals and your sleep and shouldn’t have to sacrifice either to get through a night. If you are in the market for an air bed, there are qualities to look for to ensure that you or your guests do not wake up in the middle of the night in a slowly-deflating puddle of materials. For example, products that are not easy to puncture can help protect your sleep space from the curious claws and playful nips. Heavy-duty materials and reinforcements can not only help prevent damage, but it can help the product to last longer as well. A great warranty that covers punctures will also go a long way. Of course, for the health of the sleeper and the animal, choose non-toxic materials. Many options have built-in air pumps to make them convenient, whether you are setting up a space in your home or going somewhere else. Just make sure that while you choose a product fitting for your animals, it also provides support and comfort for you. Inflating can be a difficult chore – or it can be quick and easy. A pump is incredibly convenient to have for these situations. Surprisingly, some models still require the use of a hand or foot pump, which demands that you put in some sweat and effort before you can lay down for the night. On the other hand, other mattresses come with inflating units that run electrically. Either through the use of batteries or by plugging the unit in, these make inflating your bed no problem at all. The most significant advantage to an automatic pump is the ability to add air back into your mattress during the night. If you wake up in the middle of the night to find that it is losing air, you can pump it back up with just the flip of a switch. This is a great convenience, and it may make the extra cost worth the investment in your mind. No one wants to manually re-inflate a bed in the middle of the night. Naturally, this is a critical point (read more about the study). You don’t have to think about how well your spring mattress is going to hold up over the night, but you do need to concern yourself with this feature when it is only air between you and the ground. As was mentioned earlier, this is a point that is of particular concern when sleeping in a cold environment – such as outside while sleeping in a tent. If you are tenting somewhere that the nighttime temperatures are going to drop significantly, you need to make sure your mattress is going to hold as much air as possible. Cold temperatures are going to cause the air to condense, meaning there won’t be as much left to support you in the morning as there was at night. While there isn’t much that you can do about cool temperatures, you can pick out one that is going to hold on to as much air as possible. If it has a leak or two, and you combine that problem with weather conditions, you will suddenly find yourself laying on the ground. Shop for quality products which have been well-built and designed to prevent leaks whenever possible. We put together a guide on how to fix a leak. It is a nice bonus to buy one that comes with warranty protection of some kind. Or, at least, you should consider buying from a company which has a good reputation for reliable customer services. If something goes wrong, you don’t want to be all on your own to get it fixed and back to working order. This is especially important with a self-inflating mattress that has a motor to consider as part of the overall product. Of course, your coverage on these points is going to be directly related to the amount of money you invest. Buying an expensive one should return you some form of warranty protection, while you will likely be on your own if you purchase a cheap model. In the end, you need to think about what you want to get, and how long you would like it to last. Finding a product with a good warranty provides for peace of mind, but you can be sure that you will pay for this benefit in the purchase price. It should go without saying that you are going to want to consider price along with all of the other points carefully. You are going to have to pay around a couple hundred dollars to purchase one of the more quality options. Or, you can opt for the inexpensive route, which will keep your cost way down but will also limit the comfort and features that you enjoy. In the end, it’s all about what you want this mattress to do for you. Just looking for something decent to set on the floor of your tent while out sleep in the wilderness for a few days? You can probably save money by buying an affordable model from a respected brand. Need one that you can inflate in the guest room for a week while your family is in from out of town? You may wish to purchase a nicer model that can provide them with a better night of sleep. Think about your own needs and then set a budget for the purchase that matches up with those requirements. How can I make it feel softer? A topper is a great way to change up the feel of your mattress without completely starting over with a new bed. These products typically add a few inches of pressure-relieving comfort to the top, but sinking into softness can reduce the amount of exposure your body has to circulating air and can often retain heat. Thankfully, many companies are one step ahead and have designed toppers that consider the additional heat they’re delivering with their toppers and have included features like gels and more breathable textiles to offset these issues. If you're interested you can see our top cooling toppers here. Blow up mattresses are not the biggest purchase you are going to make in your life, but it is one that you want to get right. There are few things in life quite as important as a great night’s sleep, and picking the right one is key to getting the rest you need to be at your best during the day. Whether this mattress is going to be used by yourself or someone else, you will want to do the research necessary to pick out the right product for your requirements. With so many options on the market today, it can be hard to settle on a specific pick. Take your time to review the information above, however, and the right choice just might make itself clear. And if you want to get a regular mattress, check out our top picks here. I have two SoundAsleep Dream Series for my parents when they visit and they say it’s pretty good. My husband also loves it. Katherine, We are thinking of getting an air bed for guests. We are considering two twins and using them with king sheets and linen. Do you think this option would give the guests a better night of sleep because there will be less movement felt by the other guest. My second one just arrived and it also had a leak. I’m just unlucky maybe. You never can tell any more if a review site is legitimate or a front. I was surprised to see intex so much. I’ve had 2 twins catastrophically fail. also have a serta which developed several leaks. My next and last one will be a full size, probably the insta bed above. I appreciated the pros and cons on each item. I’m currently sleeping on the floor which I don’t really mind and may wholly embrace for environmental reasons. Really hate having big bulky furniture to deal with. Hey Bruce, thanks for your insight. I’ve never had problems with mine but I rarely use it these days. We will definitely revisit this article during the next few months. There are couple new products we want to review first. Please I’m looking for an inflatable mattress that will stand up to daily use what do you recommend? Very well done. Absolutely brilliant information. I’m in love with this blog. they always provide such a great information.